HEC-GeoEFM is used in the spatial analyses phase of the HEC-EFM process to help manage and assess spatial data layers and to quantify the amount and connectivity of ecological habitats generated by different water management or ecosystem restoration scenarios. In an HEC-GeoEFM project, data layers are organized according to management scenario and ecosystem concern. For example, in the figure below, layers are being added to a Standard View for the "Natural" flow regime and "Little minnow spawning habitat" relationship. HEC-GeoEFM has three types of views: Standard, Combo, and Custom. Standard Views are collections of map layers for individual pairings of flow regimes and relationships. Combo Views are used for pairings of flow regimes and combo relationships, which detail how two or more relationships are grouped to represent a single ecosystem dynamic. 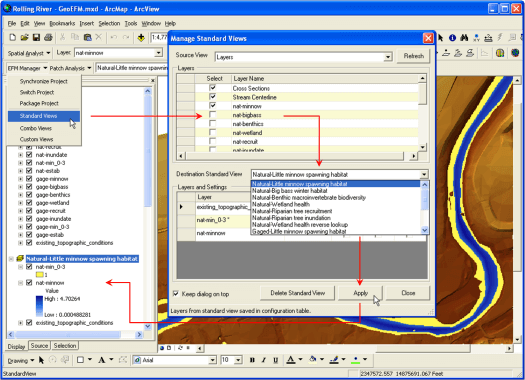 Custom Views are created by the user as work space to perform whatever comparisons or computations are needed in support of an HEC-GeoEFM project. 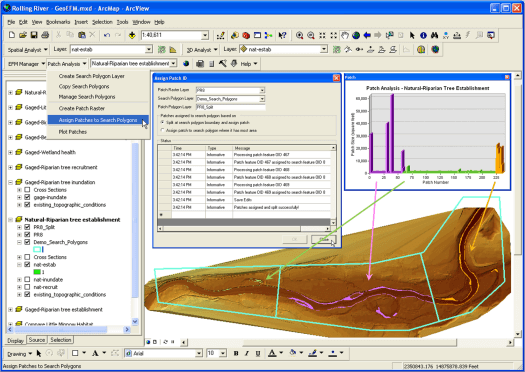 HEC-GeoEFM has a tabulate tool that allows users to compute, report, and archive total habitat areas. 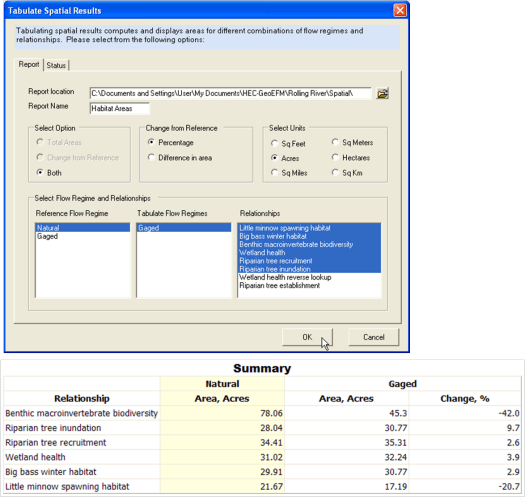 Options are provided for selecting the desired flow regimes and relationships, output units, and mode of comparison for multiple flow regimes. The Patch Analysis feature of HEC-GeoEFM is used to analyze how different patches of habitat are connected. Output includes the number and size of patches that occur within user-defined areas of interest.